It's a Thursday morning at Fairfield High School in Bristol and lessons are getting underway. This morning's class - knife wounds, and what to do if you come across someone who's been stabbed. It might seem like a radical step to start teaching children as young as 12 how to deal with such incidents, but there is evidence to suggest that the number of attacks involving knives is on the rise, and especially amongst young people. Figures obtained by the Liberal Democrats show a rise of a third in five years in the number of people admitted to hospital with stab wounds, with the sharpest rise involving people under eighteen. There isn't a particular problem with knife crime in Bristol - it's not one of the government's so-called knife "hot spots" that have been targeted by the Home Office - but even so those on the front line say the problems are getting worse. 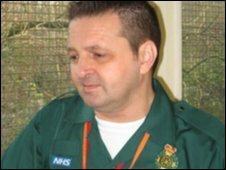 Gary Smart has been a paramedic for thirty years and is the head of paramedic science at the University of the West of England. It was his idea to start the classes, which are given by trainee paramedics. "It's going to be very useful if young people are trained to look after each other, to help each other, not to run away when they see someone be stabbed." "Over the last five years or so, through personal experience and talking to my colleagues, stabbings have definitely gone up," he said. "It's unusual for a child to be stabbed, but we know, as with some of the big stories that hit the papers and the media that it does happen. "We can think back to Damilola Taylor, he, unfortunately succumbed to blood loss. "If one of the young people in that group that was involved in the stabbing had a knowledge of first aid perhaps they could have made a difference there." Now Mr Smart and his students are taking that knowledge into the classroom, teaching children as young as 12 how to stem blood loss, bandage a wound, and hopefully give the victim a better chance of survival. The mood in the classroom is upbeat as Mark Kinsella, a student paramedic moulds a fake stab wound onto the arm of one of the pupils. This time around it's nothing more threatening than plasticine, fake blood and a pen for a knife. But the message behind the course is serious - that people who carry knives are more likely to be stabbed themselves, and that such wounds can be fatal. The hope is that by teaching pupils how to deal with the consequences of knives they'll also realise the risks involved. The scheme has won the support of Richard Taylor, whose son Damilola was stabbed and died from blood loss in a stairwell in Peckham, south London in November 2000. "There are incidents where life can be saved though the use of this scheme which would be very positive," he said. "It's going to be very useful if young people are trained to look after each other, to help each other, not to run away when they see someone be stabbed. "The pilot programme can be tested, and see and then it can be rolled out. "I would like to see it be rolled out because it is going to be useful if it is tested and found to be very useful." At Fairfield High School it's the end of the day and the paramedics are running a feedback session to see what pupils have learnt. Gary Smart says the reaction wherever they run it is overwhelmingly positive, and the pupils in this class feel confident about what they've learnt. "I think it was a really good thing to learn how to cope with situations and know what to do," says Will, aged 11. But it's very different in the classroom compared with out on the street. Would he still be able to cope? "Yeah, I think so," he said. "I hope so. I think I will be able to cope with it when it does actually happen." The reality is that most of these children will probably never come across someone who has been stabbed. Even now such incidents are relatively rare. But it is perhaps a sign of the level of concern that knife crime now generates amongst both teachers and pupils that Gary Smart has been inundated with requests to bring his plasticine and fake blood into classrooms across the city.